Continuing to use the early photographic method of cyanotypes, I will make portraits of bodies for the Luminous Bodies Thematic Residency. 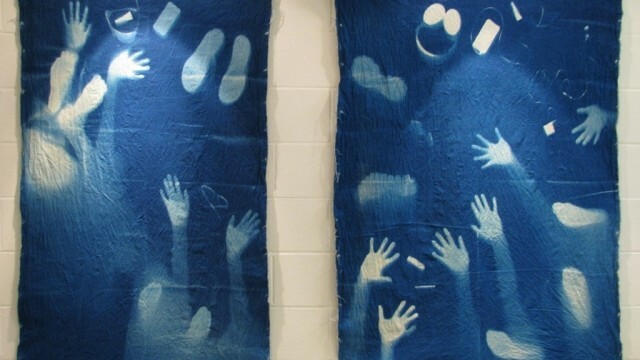 I am interested in cyanotypes as a means to contest supposed photographic objectivity. Having increased the scale of the cyanotypes that I produced over the past two summers, I have also begun to dye the canvas to produce novel and unusual colour combinations, further disrupting the perception of photographic events. While I would like to produce works on a much larger scale, I am also interested in researching the use of natural fabric dyes for my process. Looking at the history of cinema, I have come to appreciate the films of Friedrich Wilhelm Murnau, a pioneer of early German films, including The Haunted Castle and Nosferatu, as well as Lotte Reiniger’s feature length stop-action animation, The Adventures of Prince Achmed. Both directors make astonishing use of light, shadow, and saturated colour. Using canvas surfaces area roughly 2 metres by 4 metres, I would be able to draw on the cinematic not only in its portrayal of bodies, but also movement and time. I would also like to engage people present at the Toronto Islands by taking photos using an Afghan box camera, or kamra-e-faoree. The relatively simple apparatus allows negative images of subjects to be taken on the spot, then re-photographed, producing a positive image roughly the size of a passport photo. While the resulting photo provides a fairly accurate record of a person’s likeness, the ramshackle apparatus, and manner by which it produces images once again problematises photographic objectivity, particularly in terms of identity.